Netflix made a fantastic call when it debuted Tidying Up With Marie Kondo at the first of the year. Many people vow to declutter, lose weight, get more organized, and improve their lives at the beginning of each year. 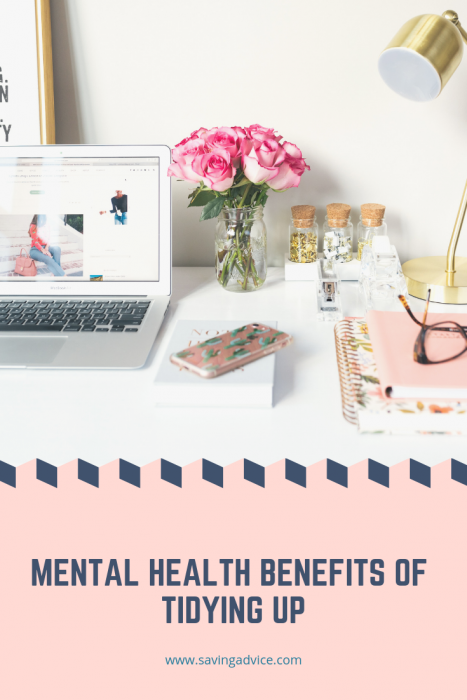 While each resolution has the potential to positively impact your life, there are a few significant mental health benefits of tidying up. Serious mental illness costs the United States more than $1.93 billion in lost earnings each year. In fact, depression is the number one leading cause of disability worldwide. Mental health has a huge impact on the economy, not to mention the lives of millions of people. Check out the infographic below for more mental health statistics. There’s no doubt that some of the numbers detailed above are unsettling. Doctors, researchers, and scientists are constantly looking for natural ways to better manage mental health. Could the Marie Kondo method of decluttering benefit your mental health? What Are the Mental Health Benefits of Tidying Up? Your living space heavily impacts your mental health. If you are constantly in a space that is cluttered or dirty, you are less likely to feel good. Not only that, but it has been proven that organization can have the following positive impacts on mental health. Organization helps you think more clearly and you won’t get frustrated as easily. When you declutter your space, you declutter your mind as well. You’ll find yourself being more productive and able to think more clearly in your new clean space. Decluttering and tidying up shows you care about yourself. Tidying up is another way to practice self-care. When you clean your living space, you show you care about yourself. When you go to clean up, it isn’t as difficult because things are already tidy. This is one of the biggest perks of tidying up and decluttering. Any time you go to do your regular household chores it doesn’t take as long because there is no clutter to move around or go through. You feel satisfied after you’ve cleaned up and organized. It feels great when you step back and look at your newly organized closet or desk. Many people find themselves to be more efficient. When you organize your space, it can make things way more efficient. You’ll find yourself knowing where things are and your day-to-day activities moving faster. Having an organized mind can lead to further positive change in other aspects of life. Once you tidy up, declutter, and get organized, you’ll probably find you are more organized and excelling in other areas of life as well. What is better for your mental health than to continue to improve? With more than 44 million American adults suffering from some kind of mental health condition, it is important to find ways to improve your mindset on a day-to-day basis. Consider the mental health benefits of tidying up and how much it could save you. If you’re interested in finding out more about the Marie Kondo method, check out The Life-Changing Manga of Tidying Up: A Magical Story. You can also watch Marie in action in Tidying Up With Marie Kondo on Netflix. Readers, do you find tidying up improves your overall mental health?